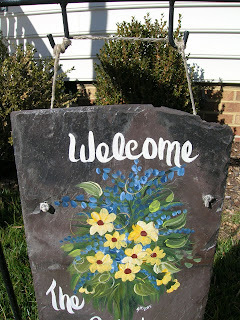 A Home That Says "Welcome"
As I was looking around my home today I noticed I had a lot of signs and pictures that convey the sentiment of "welcome." The slate below is found above our front door. Here is our front yard sign that is made of slate. It also beckons you to "come on in, you're always welcome here." This tea stained sampler is a favorite of mine. 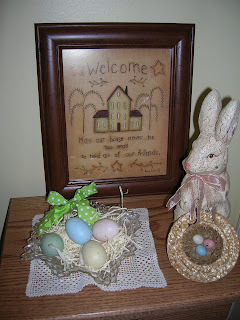 It can be found on the entry table of our home. It reads, "WELCOME, May our Home never be too small to hold all of our friends." And finally, this sign can be found on our back porch. 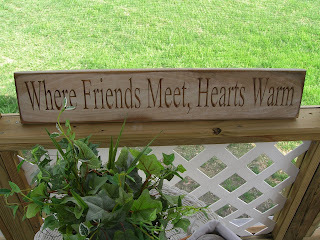 It reads, "Where friends meet, hearts warm." Now, all this got me to thinking. 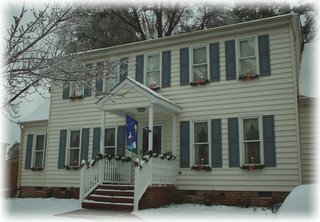 (Y'all know me, I just can't help it;) By all "outward appearances" my home appears to be a most "welcoming" place to others. 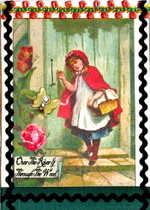 It conveys the message of "open doors" and "open hearts." But what I asked myself is, "what good are all these outward appearances of "welcome" when in reality it is not always practiced in my home? OUCH! Talk about being convicted. I wanted to share with you a wonderful book I have been reading. 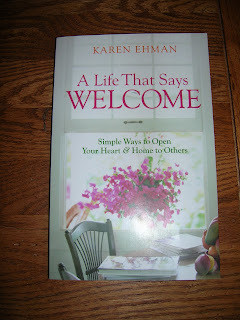 It's title is, "A Life That Says Welcome," and it is by author Karen Ehman. Boy, after reading her book I knew that MOST ANY of my excuses for not practicing hospitality were just NOT going to "cut" it! Uh, oh! The gift of hospitality is one that I am to give freely, wholeheartedly, and lovingly to others. Going one step further, I have to admit that it is much easier to entertain friends and family than it is to entertain acquaintances or even strangers, but that is what we are asked to do. We need to get it out of our heads that everything has to be PERFECT before we will invite anybody over. If we are waiting for PERFECT, then we have a mighty, mighty long wait, don't we? Over the next few weeks I will be sharing with you some ideas that you can incorporate into sharing hospitality and opening your home to others. In the meantime, I have just one thing I would ask you to do. Pray about who the Lord would have you to invite into your home. Who is it that he wants to come to your home so that when they reach your front door the sign not only says welcome, but so does your heart! Oh! I've been wanting to get that book. I put it on my wish list. Do you recommend it? This post reminds me of the book Im reading too "My Hearts at Home" by Jill Savage. She talks about hospitality too. 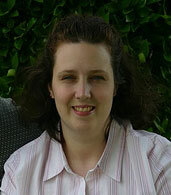 Susan, what a great post for us all to read:) I also like all your welcome signs--so nice. I will keep that book in mind also. What a great post, Susan! I, too, struggle with things being "perfect" before others can come over! Am looking forward to more posts on this subject! I'm thinking of getting that book next week when I receive my new "book allowance" from the budget. 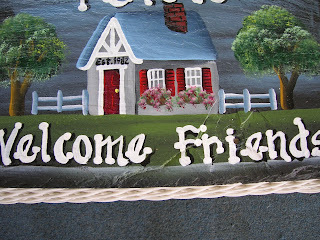 Also, I was looking at my welcome mat (as I gave the front porch a good Spring cleaning) and then all the pretty "stuff" I have for showing hospitality and realizing...I can't remember the last time I had someone over that wasn't family! I love the series posts. I'm looking forward to reading yours. I love welcome signs, Susan..they really do beckon one in. 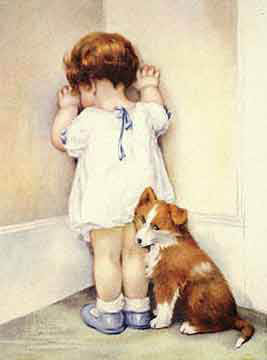 I love being hospitable, but don't always get it done. Thanks for the reminder! Thank you, Susan, for the great reminder about practicing hospitality. I am one of THOSE types, one who feels like EVERYTHING needs to be PERFECT before inviting anyone over ... and I know that's just not how it should be! All of your signs are just charming, Susan! It sounds like a wonderful book, I will have to look for it at the bookstore! Susan, what a great post and reminder! I am one who always wants everything *perfect* to invite people over. I need to get over that! I look forward to hearing more of what you have to say about this subject! 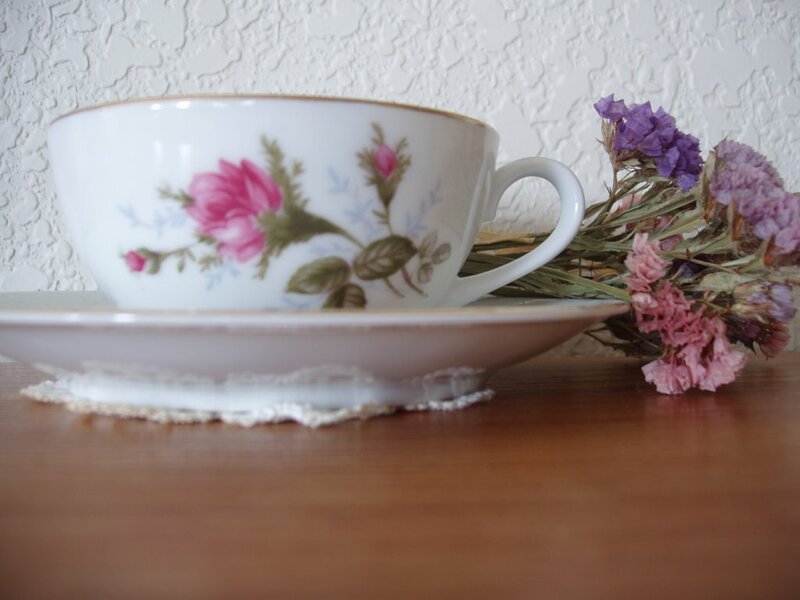 As a single lady, I am already collecting little things to make my future home more warm and homey :D I like the things you have outside of your home to make your guests feel welcome. Thanks so much for sharing this book; I am looking forward to what you have to share here....I have such a desire to be hospitable, but don't know how to get it going...if that makes sense.